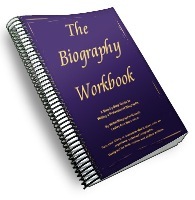 A step-by-step, fill-in-the-gaps, guide to writing your life story, or someone else's life story. Lesley Ann acts as your own personal ghostwriter as she guides your through your entire life story, word by word, one sentence at a time. Write about your Ancestry, Childhood, Schooling, Conflict, Teenage Years, Relatives, Cars, Loves, Losses, Careers, Travel, Present Lif e, Future Dreams - and much more! Lesley Ann has ghostwritten many autobiographies: farm life in Nova Scotia , surviving the trenches in WWII, growing up in Scotland in the thirties, living with medical challenges, experiencing the harsh realities of racism, African tales, Middle Eastern Immigrants to the West, following a personal career goal, life of a celebrity, and so on… She now shares her investigative techniques with you in “The Biography Workbook”, to help you become the proud author of your own life story.